Like most other cities in America at that time Newark had its share of amusement parks in the nearby vicinity. 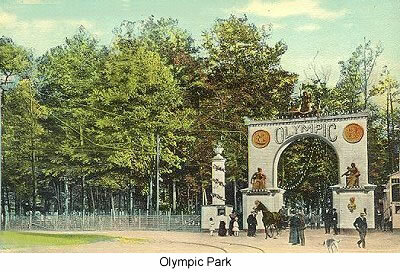 In Newark, near Elizabeth, was Dreamland Park, in Cliffside Park was Palisades Park and in Irvington was Olympic Park. A ride to Olympic Park involved a 5¢ bus fare after walking to the #14 bus line, getting off at the city line and then walking the rest of the way to the park. I don't recall what the park admission was as I never paid it. There was always some sort of a promotion going on that allowed one to gain admission to the park in exchange for bottle tops, candy wrappers or some other sort of premium. Anyone looking for the particular premium was sure to find it. The main attraction in Olympic Park was a huge swimming pool that always seemed to maintain a cool temperature even on the hottest days. We went to the park well supplied with sandwiches so that we could enjoy lunch at pool side at no cost. When we had our fill of the pool we next walked about the park to decide how to spend our money and/or premiums. There was the usual assortment of rides, a fun house and games of skill and chance. One of the more popular games was called Pokerino. This was a game in which the player rolled 5 balls down an alley toward holes located at the alley end. The holes were marked as playing cards. The object of the game was to get a winning poker hand. Winners were given cards with point amounts. The cards could be redeemed for a prize at once or could be accumulated and redeemed at some future time. Young boys were employed to work behind the counter in the Pokerino Palace to make change, give out the winning points and to return a ball to a player that did not end up in any hole. I guess I was about 13 years old when I became convinced that my destiny lay in working in the Pokerino Palace.